After my braided garlic herb bread, I couldn’t resist trying a sweeter braid. 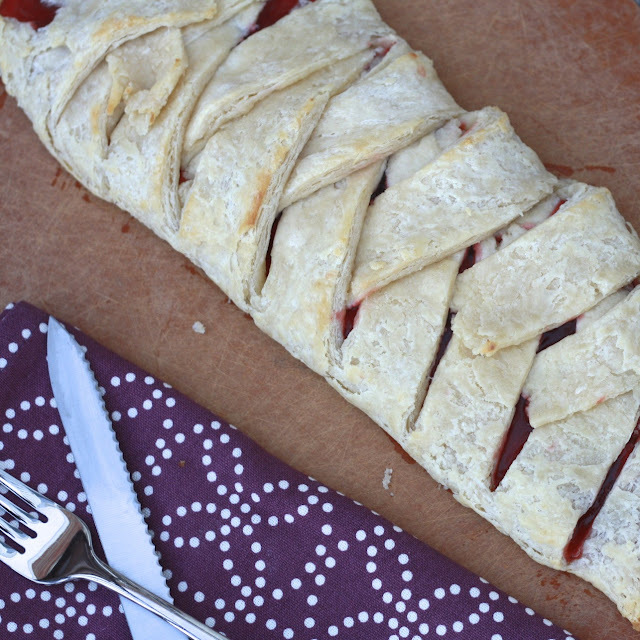 I’ve long had Julie’s raspberry almond breakfast bread bookmarked, but since I had some extra cherry pie filling on hand (from the mini cheesecakes), I switched up the filling a bit. This is one of those recipes that looks impressive on display, but is in fact ridiculously easy. I made the entire thing after work one Friday afternoon and before we headed out the door to babysit (I lead a wild and crazy life), I was already cutting a slice off to sample. 1. Preheat oven to 425F. In the bowl of a food processor, add flour, baking powder, and salt. Add butter and cream cheese and pulse 6 times. 2. Add milk and almond extract and pulse just until dough comes together. Remove dough from bowl and carefully pat into a circle on a piece of wax paper (you don't want to overwork the dough so don't worry about it being perfect!). 3. Cover dough with a second piece of wax paper and use a rolling pin to roll dough into a 12 x 8 rectangle. 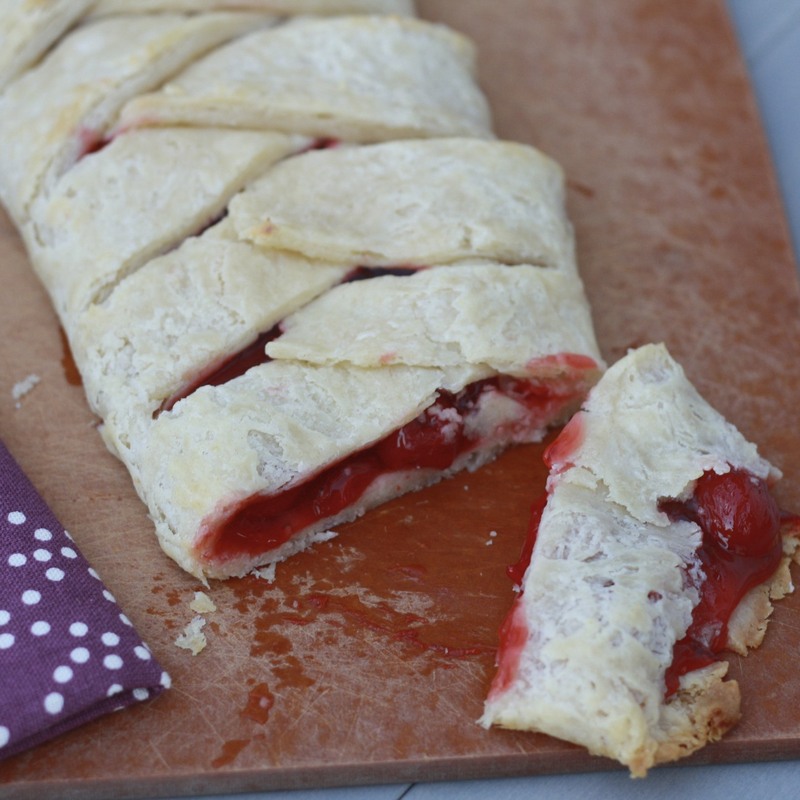 Transfer pastry to a baking sheet. Use a knife to carefully "draw" lines on the dough to cut it into thirds (lengthwise). 4. Place cherry filling along the center third of the dough. Use a pizza cutter or knife to slice diagonal strips into the outer thirds of the dough, about 1 inch wide. Do not cut into the center, cherry-filled area. 5. 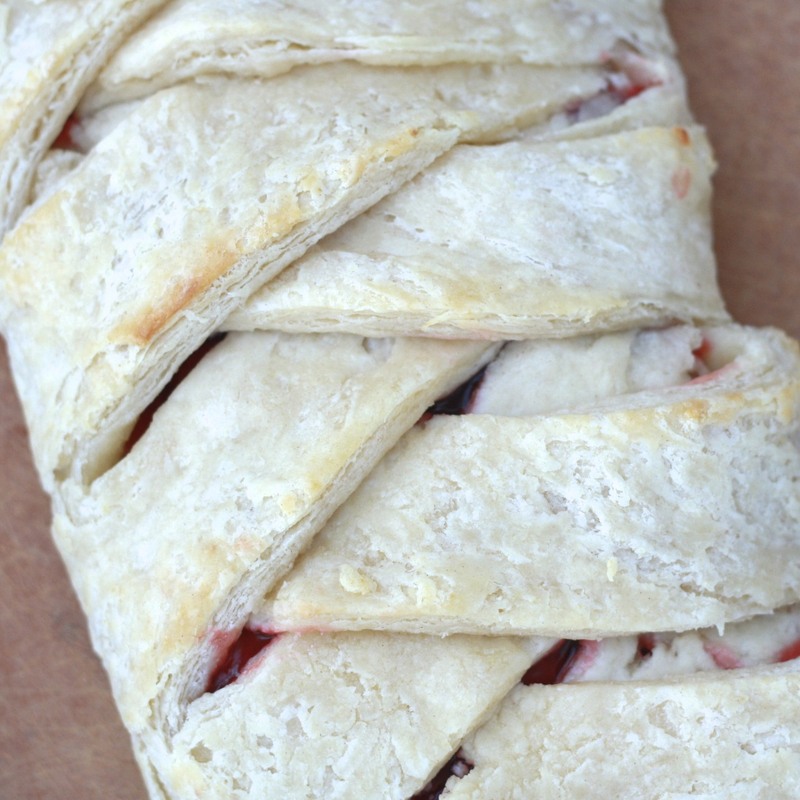 Fold strips, alternating sides, toward the middle, covering the cherry filling. Bake for 12-15 minutes, until the dough is cooked through and the top is lightly browned.